DETROIT -- General Motors posted a 7 percent U.S. sales gain for November, buoyed by strong sales of pickups and SUVs as it cleared out 2011 models. Meanwhile, sales of the Chevrolet Cruze tallied 13,238, the lowest level of the year, as Japanese rivals showed continued signs of recovery. American Honda Motor Co., for example, said it sold 17,133 Civics in November. Although that was down from a year earlier, it was the highest level since June. GM's overall sales results trailed the industrywide increase of 14 percent in November and lagged those of its Detroit 3 competitors. Ford Motor Co.'s November sales rose 13 percent, and Chrysler Group's surged 45 percent. GM's truck sales rose 25 percent while car sales edged up 1 percent and crossover sales dropped 9 percent. 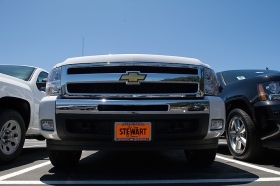 Sales of the Chevrolet Sierra full-sized pickup rose 34 percent. GMC Sierra sales were up 22 percent. Chevy Tahoe sales rose 33 percent. Don Johnson, GM's U.S. sales chief, told analysts and reporters during a conference call today that the strength in trucks partly reflected big sales of 2011 models. He said 2011s accounted for 64 percent of overall truck sales for the month. In contrast, only 15 percent of cars and 17 percent of crossovers sold during November were 2011 models. Moving those older pickups and SUVs drove up incentive spending. Johnson said incentives represented about 10.5 percent of GM's overall average transaction prices, which he added was higher than the industry average that GM wants to track. He didn't say what the industry average was. GM sold 13,238 Cruzes in November, up 64 percent from November 2010, which was the month after the car's launch. But it was the lowest of the year. GM said inventory of the Cruze swelled to an 88-day supply. That's up from 73 days on Nov. 1 and 43 days from Oct. 1, as tracked by the Automotive News Data Center. This week, GM idled its Lordstown, Ohio, plant that makes the Cruze to let demand catch up with supplies. Chevy sales boss Alan Batey said the lower Cruze sales partly reflect a seasonal slowdown for compact sedans. He said Cruze pricing remains strong: As of Nov. 19, its average transaction price was $19,200, vs. $16,400 for the Toyota Corolla, which is toward the end of its life cycle. "I think the result is actually very good," Batey said. "We're getting our share and doing it with a very strong ATP." GM's car sales got a lift from the newly released Chevrolet Sonic. GM sold 4,496 Sonics in November, up 38 percent from year-earlier sales of the Chevy Aveo, the car it replaced. The Sonic also outsold the Ford Fiesta, a key competitor, which tallied 4,124 unit sales.